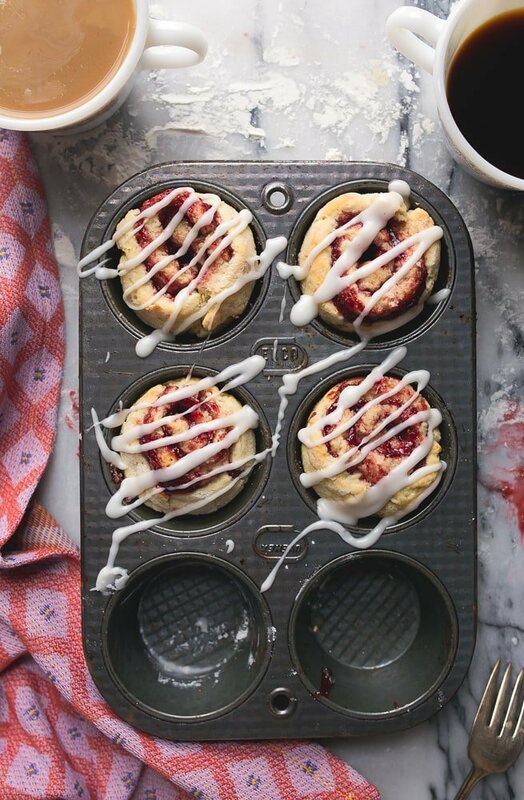 Strawberry cinnamon rolls made without yeast and baked in a muffin pan. I’m scheming up a Valentine’s Day breakfast in bed situation. It’s not that I don’t think I can convince Brian to do it. The obstacles are different. They include my extreme distaste for crumbs in the bed, and my dogs’ newly acquired begging strategy: if they’re close enough to the food, they lean in to touch it with their nose. At that point, your food has dog nose on it (and who knows where that has really been), so you may as well just give them the food. 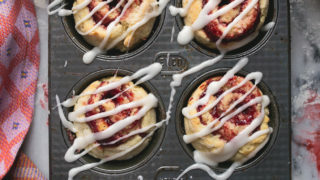 If these strawberry cinnamon rolls were in the bed, I know it would end with sticky dog noses and red jam in their fur. 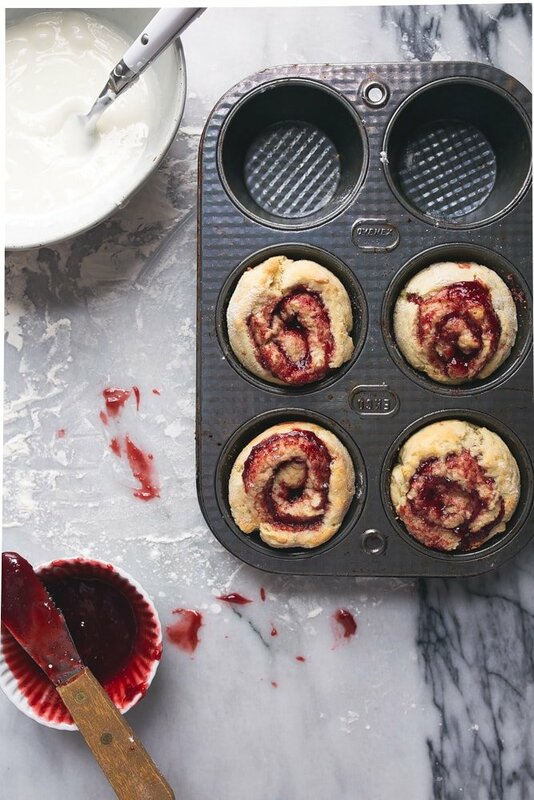 My love for these no-yeast small-batch cinnamon rolls hasn’t wavered (and clearly, you guys still love it, too), but I wanted a fruity version. I’ve been working on making a recipe for strawberry pâte de fruit, but I had a failed batch in the fridge. Side note: my recipe for strawberry pâte de fruit is finally perfect and ready for you to click on it. A failed batch of gummy candy is essentially really good jam, so I decided the time was right. That said, I think these rolls are so dang good because the jam I used was made from fresh fruit. I’m definitely not asking you to make homemade jam for these, though–I just mean that grabbing a jar of your favorite jam that tastes great is important. If you want to make homemade jam, I have a recipe for a small batch of strawberry jam. I use it to make this incredible blender strawberry mousse, in case you’re interested in that! I also use strawberry jam in my strawberry jam and moonshine cocktails made in mason jars, too! Whew, that was fun! I love working with this dough. It’s so soft and supple. These cinnamon rolls don’t require yeast to rise–instead, we’re relying on a reaction between baking powder, baking soda and apple cider vinegar. But because dough made in this way can have a biscuit-taste (all hail the mighty biscuit, we love you so..but you’re not welcome here), I included some milk and melted butter in the dough to make it softer. More tender. More like actual cinnamon roll dough. In the words of Queen Martha: “it’s a good thing.” I know Martha has the time to make cinnamon rolls from scratch, but all I really want in life is for her to try my no-yeast cinnamon roll recipe. Oh, and I’d like her dog trainer to spend some time at my house. But that’s really all I’m asking for in life right now. 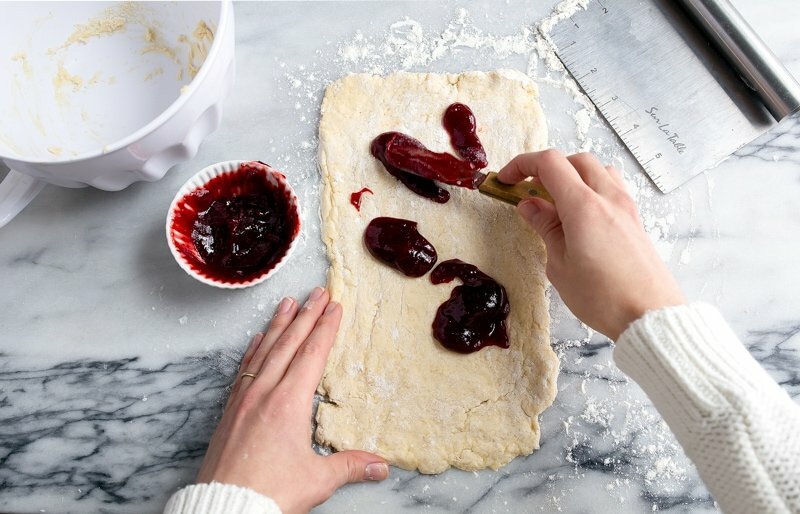 The glaze is just powdered sugar and milk, but I would be lying if I didn’t really consider stirring jam into it. But just as I was about to do it, the tea kettle went off and I quickly added the milk without thinking. If you want to make the glaze the prettiest shade of pink, add half the amount of milk, a tablespoon of jam, and stir stir stir. Add more milk to adjust the consistency. 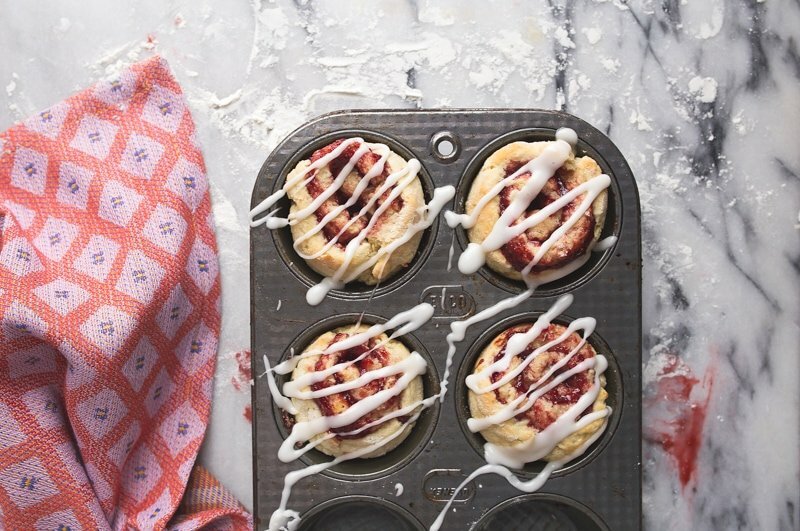 I’m so excited for you to eat these strawberry cinnamon rolls! My muffin pan that has 6 cups is vintage, but here’s a link to great 6-cup muffin pan if you’re looking for a smaller muffin pan. 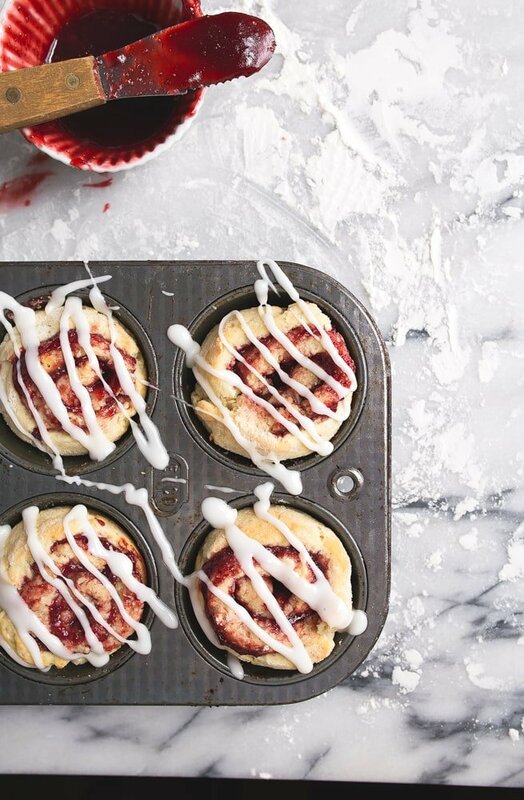 Small batch cinnamon rolls recipe for two people: strawberry sweet rolls! Preheat the oven to 375, and spray 4 cups in a muffin pan with cooking spray (or use extra melted butter). Combine the flour, the sugar, baking powder, baking soda, and salt in a medium bowl. In a small measuring cup, combine the milk, vinegar, and the melted butter. Add the wet ingredients to the dry, and stir until a soft dough forms. Heavily flour a work surface, and pat the dough out into a rectangle about 10" long by 6" wide. 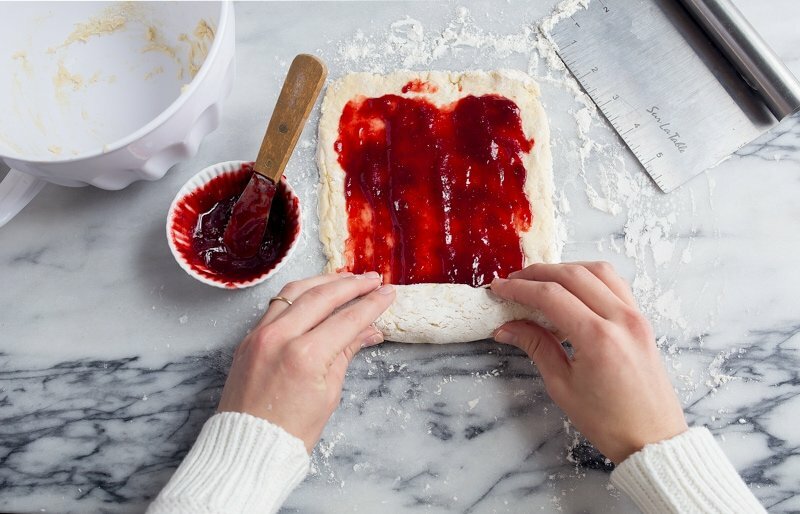 Use plenty of Spread the strawberry jam over the entire surface of the dough. Cut the dough into 4 equal pieces, drop into the greased muffin cups, and bake for 14-15 minutes. Meanwhile, stir together the milk and powdered sugar for the glaze. If it seems hard to spread, splash in extra milk. Frost the strawberry rolls when they come out of the oven, and serve. These sounds so good, I have made your small batch of cinnamon rolls before, it was my first time making any type of cinnamon roll. These will definitely be getting made. I do have a question though, where is the other tablespoon of sugar? and the other 2 tablespoons of butter? 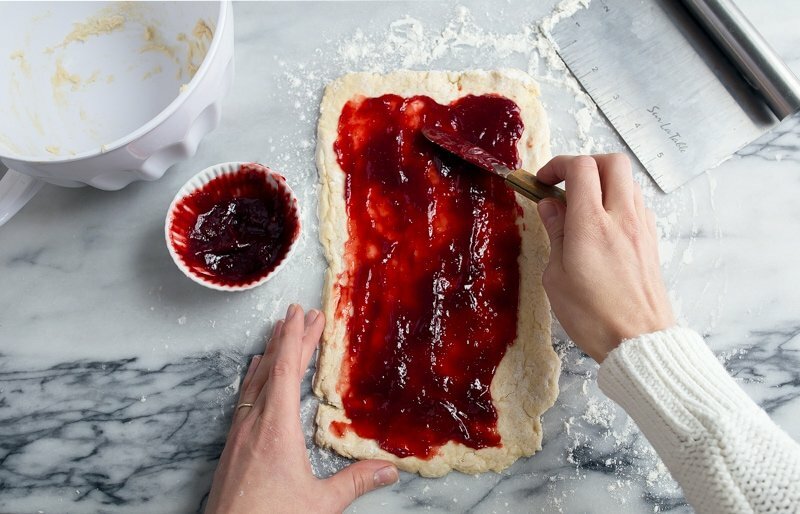 do they go on the dough before the jam? HAH. Sorry, I pasted this recipe in from the other one, and meant to delete that part. The extra sugar and butter did go in the center, but since we’re using jam, it’s not needed. Updating now, sorry! :) Good catch! Is this where the “…Use plenty of Spread the strawberry jam over…” comes in? Was part of the sentence after ‘plenty of’ deleted or left out in editing? THX – lv to read your very upbeat posts! made your small batch sugar cookies (but into hearts, obvs), frosted them with cream cheese icing, and ate them in bed last valentines day with a ginormous cafe au lait and a stack of magazines and the good wife on netflix. hello best day ever! I love your blog! I’ve tried a few of your recipes & love making just enough for the two of us. I also follow you on Pinterest so I never miss any of your recipes. I’d love to see some soup or stew recipes…or yummy winter comfort foods. Especially low carb versions as my husband is a juvenile diabetic. Hi! I am new to your blog, but I like what I see already! These cinnamon rolls like divine! Quick question though, I do not usually cook with vinegar so this may be a crazy question, but do you have to use apple cider vinegar or can you use white vinegar or something else? The only reason I ask is my daughter is allergic to apples, but I think she would love these. Also, cinnamon rolls without yeast, yes please! Awesome job on your recipes! Thank you! Awesome! Thank you! I will be trying these! Is there any substitute for the apple cider vinegar? I seem to be out. Do you have regular vinegar? Anything but balsamic? It’s like you know what I want before I even know ???? Making these now and I’m so excited to eat them! Just made these…yum!! 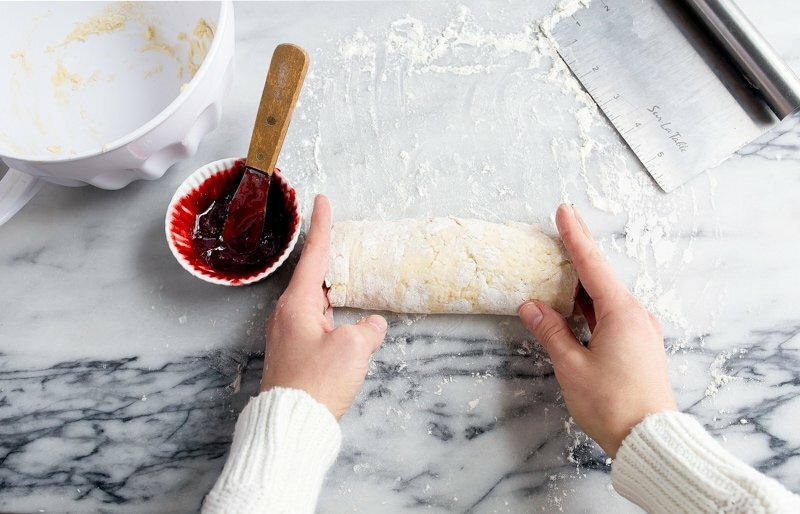 I receive a jar of homemade strawberry jam each Christmas from a neighbor and was so pleased I still had some left to use for these rolls. I’m curious if you think a bit of sweetened cream cheese added to the filling would work? These look extremely delicious! Oh, how I wish I had some now! Ha ha, those dogs are smart! These looks wonderful and I bet they would be good with any kind of jam. 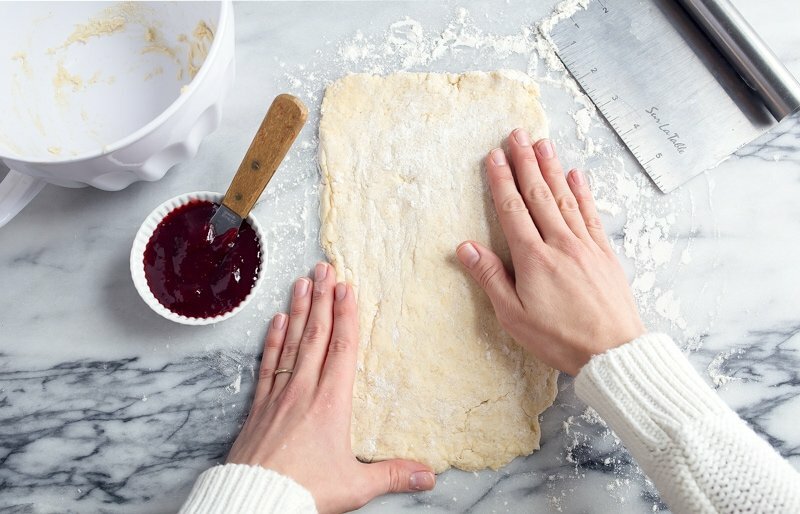 I want to do sweet rolls or such a long time and… I’m still just looking at pictures :( I’ll try to make these on Sunday! How about Raspberry jam, then sprinkle mini chocolate chips before rolling? I love that combo. Thanks for the recipe, Christina! Needed a breakfast yummy on a rainy Saturday morning. Boy did these fit the bill. I had seedless black raspberry jam. They were divine. Can’t wait to try more flavor combos. Thank you!